CINCINNATI — Hunter Dozier’s quiet night turned into a clutch, game-winning effort for the Kansas City Royals. 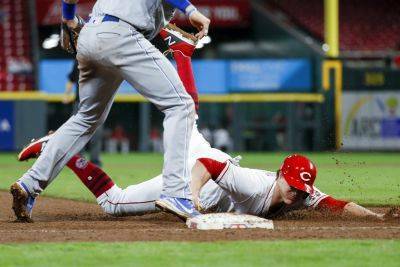 Dozier led off the ninth inning with a tie-breaking home run, then teamed with shortstop Adalberto Mondesi for a key out in the bottom of the inning as the Royals beat the slumping Cincinnati Reds 4-3 Tuesday night. Dozier’s 11th homer of the season, off Raisel Iglesias (2-5), left Kansas City needing two wins in its last five games to avoid tying the franchise record of 106 losses in a season, set in 2005. The Royals (55-102) have won three of their last four games, after a five-game losing streak. The Reds had runners on first and second with one out in the ninth against closer Wily Peralta, but Mondesi fielded Scott Schebler’s grounder and threw to Dozier at third, forcing Brandon Dixon. Jose Peraza followed with a hard grounder that Dozier was able to knock down with a diving backhand stop, leaving the bases loaded. Joey Votto grounded out harmlessly, and Peralta earned his 14th save. Kansas City manager Ned Yost felt Dozier’s play on Schebler’s grounder to Mondesi was more difficult than it looked. Kevin McCarthy (5-4) walked the first batter he faced to lead off the eighth and the Reds ended up loading the bases with no outs on Votto’s checked-swing dribbler up the third base line. But Eugenio Suarez grounded into a force out at the plate, Scooter Gennett struck out and Phillip Ervin hit a fielder’s-choice grounder to Dozier, ending the threat. Cincinnati went 3-for-10 with runners in scoring position and now are 8-for-75 (.107) in that situation over their last 13 games. The slumping Reds (66-92) have lost four straight, all against teams with worse records than their own. The Reds have also lost five of six, and their interleague losing streak reached seven games. Harvey overcame a 51-minute rain delay with one out in the bottom of the third inning. He lasted five innings and gave up six hits and three runs with six strikeouts. The former Mets’ right-hander didn’t allow a walk. He has a 7-7 record and 4.46 ERA in 23 games with the Reds, and a 4.92 ERA overall in 2018. “It was frustrating,” Harvey said. “I was pretty sharp in the first three innings. After the delay, I wasn’t as sharp. The delay cost Eric Skoglund a shot at his second win of the season and first since April 28 against the White Sox. The Royals rookie, making his 12th start of 2018 and fourth since missing three months with a strained ulnar collateral ligament, didn’t return when play resumed. The Reds announced that they were resuming an affiliation with Double-A Chattanooga. The Reds and Lookouts were affiliated from 1988 through 2008. RHP Michael Lorenzen (3-2), trying to convince the Reds that he can make the conversion from reliever to starter, will get his third and final chance this season against the Pirates in Sunday’s series finale. Whit Merrifield singled with one out in the fifth inning to extend his hitting streak to a season-high 15 games. The streak is the fourth of at least 12 games this season for Merrifield, the AL’s hits and stolen base leader going into Tuesday.